Review posted June 11, 2015. I don’t think you can have too many books on forgiveness. Even though it’s now been a long time since my divorce, I’ve been reading this book slowly, trying to absorb it. It articulates things I’d already learned about forgiveness as well as showing me new things to consider and new ways to look at it. Forgiving isn’t a journey you’ll ever completely finish, but Desmond and Mpho Tutu present a Fourfold Path that will help you deal with those who have wronged you and people you have wronged as well. As chairman of the Truth and Reconciliation Commission, I have often been asked how the people of South Africa were able to forgive the atrocities and injustices they suffered under apartheid. Our journey in South Africa was quite long and treacherous. Today it is hard to believe that, up until our first democratic election in 1994, ours was a country that institutionalized racism, inequality, and oppression. In apartheid South Africa only white people could vote, earn a high-quality education, and expect advancement or opportunity. There were decades of protest and violence. Much blood was shed during our long march to freedom. When, at last, our leaders were released from prison, it was feared that our transition to democracy would become a bloodbath of revenge and retaliation. Miraculously we chose another future. We chose forgiveness. At the time, we knew that telling the truth and healing our history was the only way to save our country from certain destruction. We did not know where this choice would lead us. The process we embarked on through the TRC was, as all real growth proves to be, astoundingly painful and profoundly beautiful…. I would like to share with you two simple truths: there is nothing that cannot be forgiven, and there is no one undeserving of forgiveness. When you can see and understand that we are all bound to one another – whether by birth, by circumstance, or simply by our shared humanity – then you will know this to be true. I have often said that in South Africa there would have been no future without forgiveness. Our rage and our quest for revenge would have been our destruction. This is as true for us individually as it is for us globally. There have been times when each and every one of us has needed to forgive. There have also been times when each and every one of us has needed to be forgiven. And there will be many times again. In our own ways, we are all broken. Out of that brokenness, we hurt others. Forgiveness is the journey we take toward healing the broken parts. It is how we become whole again. The book begins by laying the groundwork. The authors explain why we need to forgive for our own sakes. It explains what forgiveness is and is not. (Forgiveness is not weakness, is not a subversion of justice, and is not forgetting. Forgiveness is also not easy.) Then it explains the Fourfold Path of Forgiveness, an alternative to the cycle of Revenge. The first step on the Fourfold Path is Telling the Story. Telling the story is how we get our dignity back after we have been harmed. It is how we begin to take back what was taken from us, and how we begin to understand and make meaning out of our hurting…. It is not always easy to tell your story, but it is the first critical step on the path to freedom and forgiveness. We saw this so palpably in the TRC, when the victims of apartheid were able to come forward to tell their stories. They were relieved to have a place of safety and affirmation in which to share their experiences. They were also relieved of the ongoing victimization they suffered from believing that no one would ever truly know what they had endured or believe the stories they had to tell. When you tell your story, you no longer have to carry your burden alone…. The second step on the Fourfold Path is Naming the Hurt. Every one of us has a story to tell of when we were hurt. Once we are done telling our stories – the technical details of who, when, where, and what was done to us – we must name the hurt. Giving the emotion a name is the way we come to understand how what happened affected us. After we’ve told the facts of what happened, we must face our feelings. We are each hurt in our own unique ways, and when we give voice to this pain, we begin to heal it…. Often it can seem easier or safer to simply dismiss a hurt, stuff it down, push it away, pretend it didn’t happen, or rationalize it, telling ourselves we really shouldn’t feel the way we do. But a hurt is a hurt. A loss is a loss. And a harm felt but denied will always find a way to express itself. When I bury my hurt in shame or silence, it begins to fester from the inside out. I feel the pain more acutely, and I suffer even more because of it…. If you cannot, or choose not to, name your hurt to the perpetrator, then you can talk to a trusted friend or family member, a spiritual advisor, a counselor, another who has experienced the same kind of harm, or anyone who will not judge you and who will be able to listen with love and empathy. Just as in telling the story, you can write your hurt down in a letter or journal. The most important thing is to share with someone who is able to receive your feelings without judging or shaming you for having them. Indeed, because it is never easy to confront the one who has harmed us directly, I strongly encourage you to name the hurt to others first. When we give voice to our hurt, it loses its stranglehold on our lives and our identities. It stops being the central character in our stories. Ultimately, as we will discuss in the next chapter, the act of forgiving helps us create a new story. Forgiveness lets us become the author of our own future, unfettered by the past. But in order to begin to tell a new story, we must first have the courage to speak…. It is human to want to retaliate, to feel anger, and to feel a profound sense of resentment toward those who have harmed us. When we share these feelings, however, when we give voice to our desire for revenge, our rage, and the many ways we feel our dignity has been violated, the desire for revenge lessens. There is relief. Feeling this relief does not mean that there is no justice, or that it was okay for someone to hurt us. It simply means we don’t have to let our suffering make us perpetual victims. When we name the hurt, just as when we tell the story, we are in the process of reclaiming our dignity and building something new from the wreckage of what was lost. The third step on the Fourfold Path is Granting Forgiveness. As our own children grew, they found new (and remarkably creative) ways of testing our patience, our resolve, and our rules and limits. We learned time and again to use the teaching moments their transgressions offered. But mostly we learned to forgive them over and over again, and fold them back into our embrace. We know our children are so much more than the sum of everything they have done wrong. Their stories are more than rehearsals of their repeated need for forgiveness. We know that even the things they did wrong were opportunities for us to teach them to be citizens of the world. We have been able to forgive them because we have known their humanity. We have seen the good in them. We have prayed for them. It was easy to pray for them. They are our children. It is easy to want the best for them. But I also pray for other people who may irk or hurt me. When my heart holds anger or resentment toward someone, I pray for that person’s well-being. It is a powerful practice and has often opened the doorway to finding forgiveness. It might be obvious that this step is crucial, but he reiterates why that is so. We choose forgiveness because it is how we find freedom and keep from remaining trapped in an endless loop of telling our stories and naming our hurts. It is how we move from victim to hero. A victim is in a position of weakness and subject to the whims of others. Heroes are people who determine their own fate and their own future. A victim has nothing to give and no choices to make. A hero has the strength and ability to be generous and forgiving, and the power and freedom that come from being able to make the choice to grant forgiveness. The final step on the Fourfold Path is Renewing or Releasing the Relationship. Forgiveness is not the end of the Fourfold Path, because the granting of forgiveness is not the end of the process of healing. We all live in a delicate web of community, visible and invisible, and time and again the connecting threads get damaged and must be repaired. Once you have been able to forgive, the final step is to either renew or release the relationship you have with the one who has harmed you. Indeed, even if you never speak to the person again, even if you never see them again, even if they are dead, they live on in ways that affect your life profoundly. To finish the forgiveness journey and create the wholeness and peace you crave, you must choose whether to renew or release the relationship. After this final step in the Fourfold Path, you wipe the slate clean of all that caused a breach in the past. No more debts are owed. No more resentments fester. Only when you renew or release the relationship can you have a future unfettered by the past. This scratches the surface of what’s in this book. There are examples and exercises to help you along the way. Concluding chapters talk about when you are the one who needs forgiveness and about forgiving yourself. This is a beautiful book on a life-giving topic. I’ve got to admit, I’d like to wish readers a life where they never have to forgive anyone. But come to think of it, that would not be as rich a life. 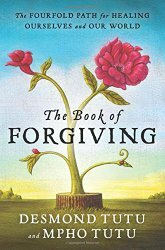 When you do find yourself needing to forgive, this book is a wonderful resource.